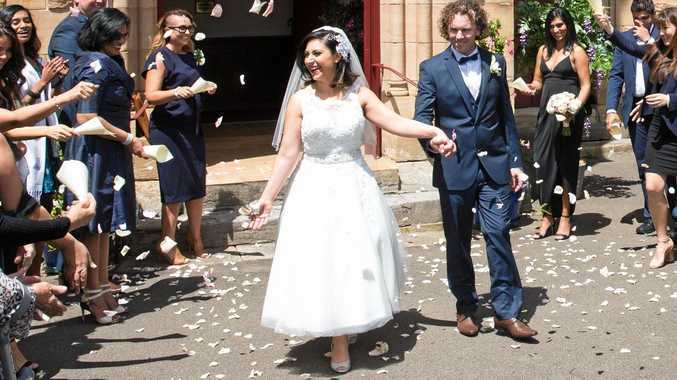 Simon McQuillan marries Alene Khatcherian in a scene from the TV series Married At First Sight. Supplied by Channel 9. DESPITE some magazine reports saying they are having twins and looking at buying a huge house together, not much has really changed for Simon McQuillan and Alene Khatcherian from Married At First Sight since the show ended. They are still very much together and managing their time week-to-week as they progress with their long-distance relationship. While Simon is still getting used to being recognised around Ipswich, now that he's not being watched by more than a million people each night, he feels that now 'reality' can kick in. Ipswich man Simon McQuillan learns to cook Lebanese food with his bride Alene Khatcherian and her family during his Sydney homestay in a scene from Married At First Sight. Supplied by Channel 9. "I said all along to Alene that this is not reality (the show). Now is the reality, where we are working hard, doing what we have to do and each night chatting to each other online," he said. "We are still taking turns to visit between Ipswich and Sydney, and taking things at our own pace. "Unlike some other people on the show we just aren't interested in getting likes on social media or being famous, we did this to find someone. "We're just trying to live our lives like everyone else. I get up, I'm working hard on my business while doing a second job to pay the bills." Simon said people have told him that he's celebrity, but he didn't think so. Alene Khatcherian and Simon McQuillan pictured during a commitment ceremony on Married At First Sight. Supplied by Channel 9. "I appeared on a TV show for a couple of weeks that's all. Mind you, in saying that I look very hypocritical about being a celebrity as I'm off to New Zealand soon to take part in Celebrity Family Feud against a team from the Kiwi version of The Bachelor!," Simon laughed. "A friend of mine I used to live with in the UK contacted me from across the ditch and said to me 'is this you?' and sent me a link. "As it turns out Married at First Sight has been a smash hit in NZ." Simon has kept in touch with several of the people from the show, and often talks to Sean from Maryborough who he shares a love of the country with, but is hopeful now that the show has finished he and Alene can get on the 'reality' of their relationship. "I might go out for dinner in Ipswich and to be honest the last thing on my mind is checking in on social media, or hashtagging some place or someone so I can get likes and attention," he said. "I don't know what else to tell people at the moment, nothing has changed since the article appeared in QT Magazine where I said that we are very much together and looking to the future."